Free display easel plans for displaying your favorite framed pictures and photographs. This version stands about 300mm (12 inches) high measures about 230mm (9 inches) wide. Made with project timber using an electric drill and a hand saw. Here is a perfectly simple and easy woodworking project you can make in less time than it takes to make a cup of coffee. A great project for someone who is new to woodworking looking to practice their skills but still wants to make something interesting and useful. 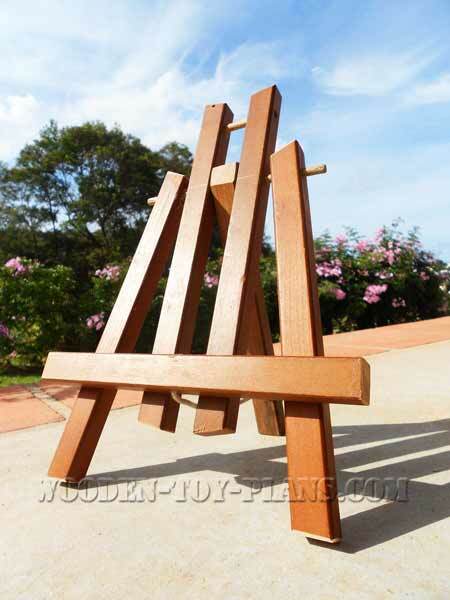 To make this display easel, you will have to buy a 1.8m length of 19mm square project timber. In feet and inches, that translates into a piece of one inch timber 6 feet long. You will also need a length of 9mm dowel (about 250mm or 10 inches) and a length of braided cord or very thin rope. You will also need a few very small very thin nails no longer than 30mm or 1 ¼ inches, sometimes called brads. Just in case you are wondering, I made mine from a recycled wooden outdoor umbrella. It was caught by a gust of wind and smashed onto the roof of the house. The wooden spokes that supported the canvas was the perfect size. I find a combination square an essential marking out and measuring tool. It also functions very well as something that woodworkers call a story stick. By setting the ruler at the required length, I can transfer the measurement to all the pieces. There are four sheets included. Sheet 1 shows the front and side view. Sheet 2 shows the component parts with dimensions. Sheets 3 and 4 are full size templates that may prove to useful in the final assembly process. Cut each sheet along the line marked “Join Here” and join them together. Start by cutting the pieces to size. Use the sliding bevel to measure the angles. Because the sizes are so similar, it would be a good idea to mark each piece as you go along, and make sure you mark them as a handed pair. For example, mark Part 3 as left or right. Drill the holes at the angles shown in the drawing, again making sure that you have a left and right hand pair for Part 3. Part 4 is the tripod support leg, and it needs the protruding part trimmed off. Cut the two dowel pieces to length. This is where you can use the full size template drawings which are included in the display easel plans. Thread the dowels into each piece and check against the template for the correct position. Carefully knock a brad (small nail) into Parts 2 and 3 in the area where it will meet Part 1. Allow the end of the nail to protrude just a little on the other side. Place Part 1 in position on the full size templates. Position the other parts in place and drive the nails in all the way. Fix the cord and the project is complete.